Sen. Susan Collins, R-Maine, indicated on the Senate floor Friday that she would vote in favor of the Supreme Court nomination of Brett Kavanaugh, ensuring that the Kavanaugh will be confirmed as a Supreme Court Justice when a final vote is taken this week. Sen. Jeff Flake, R-Ariz., also indicated he would back the nominee, meaning Kavanaugh has the support of at least the 50 senators he needs. Collins also indicated that she was not persuaded by efforts to attack Kavanaugh’s character, citing his sterling reputation as both a jurist and a family man. After Collins said she would support Kavanaugh, Democratic Sen. Joe Manchin of West Virginia said he too would back the judge, giving him what is likely to be a final total of 51 votes. Since there are 51 Republcians and only a majority of the Senate is needed for confirmation, the only thing that could sink the nomination of Brett Kavanaugh to the Supreme Court is if two Republicans oppose it. And the pair whom conservatives and the White House are most concerned about, Sens. Susan Collins of Maine and Lisa Murkowski of Alaska, issued statements last night that should provide a sense of comfort. I’m not expert on legal matters. And I’m not an attorney, and I have the bank account to prove it. But I do know how to read the tea leaves in Washington. Judge Kavanaugh has impressive credentials and extensive experience, having served more than a decade on the D.C. Circuit Court of Appeals. I will conduct a careful, thorough vetting of the President’s nominee to the Supreme Court, as I have done with the five previous Supreme Court Justices whom I have considered. I look forward to Judge Kavanaugh’s public hearing before the Senate Judiciary Committee and to questioning him in a meeting in my office. There are no hints of concern, which she could have added. And Collins, who comes from a family of politicians and is a swamp creature in pretty good standing, notes Kavanaugh’s “impressive credentials and extensive experience.” That is, he’s been hanging around the swamp for quite some time. So that looks pretty good to her. To be nicer about it, Collins has vast experience and respects others who do as well. As long as Kavanaugh pledges to consider “precedent,” which she says is her key concern – and a sneaky way for her to say she thinks he’ll uphold Roe v. Wade – she will probably back him. And Kavanaugh is going to talk about precedent during his hearings as if it were his favorite uncle. I intend to review Judge Kavanaugh’s decisions on the bench and writings off the bench, and pay careful attention to his responses to questions posed by my colleagues on the Senate Judiciary Committee. The American Bar Association’s Standing Committee on the Judiciary will also review Judge Kavanaugh’s qualifications prior to these hearings and issue a rating. I intend to carefully consider that rating, the information obtained through personal meetings, my own review of Judge Kavanaugh’s qualifications and record, and the views of Alaskans in determining whether or not to support him. Again, no hint of anything negative. And note two things here. First, like Collins, Murkowski is emphasizing Kavanaugh’s qualifications, since she suggests she’ll give strong weight to the opinion of the American Bar Assocation, which reviews whether he’s fit to serve. The ABA has rated the last six nominees, including justices Alito and Gorsuch, “well qualified.” No doubt they will do the same for Kavanaugh, since the one thing everyone agrees on is that the veteran judge and Ivy League grad is well qualified. Second, she also points to the opinion of Alaskans. It’s hard to imagine that people in this heavily Republican state will oppose a mainstream conservative justice. It will be a rocky road and a pitched battle. But by choosing someone who has worked for years in the swamp – as a judge in Washington and as a Bush administration official and member of Ken Starr’s Whitewater investigative team – and who yet still seems quite conservative, Trump appears to have made a choice that will be approved by the Senate while also galvinizing his conservative base. Pretty smart. Sen. Susan Collins, R-Maine, is pretty irritating, I have to admit. She’s always saying, essentially, Well, I don’t know, I just might not be a Republican today, okay? I guess that’s what a Republican needs to do to survive in the Northeast. Still, it’s annoying. Anyway, Collins did not say Sunday during an interview with CNN’s Jake Tapper that she will oppose any Supreme Court nominee who is hostile to Roe v. Wade, as some reports are suggesting. She said she would oppose anyone who admitted it. “I would not support a nominee who demonstrated hostility to Roe v. Wade,” she said. Get it? The key word here is “demonstrated.” Nobody talks like that except attorneys and politicians, who speak very, very carefully – so as to be MISunderstood. Here’s the full exchange. It occurs near the video at the bottom of this post. COLLINS: I would not support a nominee who demonstrated hostility to Roe v. Wade, because that would mean to me that their judicial philosophy did not include a respect for established decisions, established law. And I believe that that is a very important, fundamental tenet of our judicial system, which, as Chief Justice Roberts says, helps to promote stability and even-handedness. TAPPER: So, you will not support anyone who has demonstrated hostility towards Roe vs. Wade, but there are plenty of justices that The Federalist Society and other experts likely think will vote to overturn Roe vs. Wade, but they don’t have a record of hostility towards Roe vs. Wade. For instance, don’t you think, just as an academic matter, Neil Gorsuch, for whom you voted, don’t you think he is probably going to vote to overturn Roe vs. Wade if given the chance? So she tries to bury this whole thing in respecting “precedent.” As if Roe v. Wade is a fine red wine that gets more delicious with age. So a nominee position, whether or not they respect precedent, will tell me a lot about whether or not they would overturn Roe v. Wade. A candidate of this import position who would overturn Roe v. Wade would not be acceptable to me, because that would indicate an activist agenda that I don’t want to see a judge have . . . I don’t like to go into the details of my conversation with the president, but he did tell me that he would not be asking that question. And indeed, it would be inappropriate to ask a judge nominee on how they are going to vote in a future case. See? She’s going to try to infer his position. And let’s just note here how deeply ironic it is that she is stating that she doesn’t want an “activist” judge who woiuld overturn Roe v. Wade, when the decision is the most famous example of judicial activism in history. Yeah, I get precedent. But in matters of life and death, precedent goes out the window. And she knows that. Collins is not making a serious point about judicial philosophy. She is making a serious point about getting reelected in Maine. But she is not saying she will oppose a conservative justice who would overturn Roe V. Wade. Congressional Republicans deployed a brilliant strategy to gut Obamacare by camouflaging within the tax cut bill language ending the insurance purchase mandate. Had they tried to run that as a “standalone” measure, it no doubt would have been defeated, as was their initial effort earlier this year to wreck Obamacare. The requirement that everyone purchase insurance helps Obamacare survive by guaranteeing income to insurers that they lose by being forced to cover everyone – including the sickest people – and give them the same basic coverage no matter their needs. By requiring younger, healthier people who would forgo insurance to pay for it, insurers get the cash they need to pay the bills of the least healthy. Without this requirement, insurers would take a big hit and have no reason to participate in the health care “exchanges” providing insurance to individuals. But in order to get the vote of moderate Republican Sen. Susan Collins of Maine for the tax cut, Senate Majority Leader Mitch McConnell agreed to move legislation that would have taxpayers restore “cost sharing” payments to insurance companies, which would help them deal with the expected decision of many healthy young adults to stop buying insurance. This would, of course, undermine the whole purpose of eliminating the mandate. Fortunately, it appears that House Republicans are going to reject the idea, which the Senate wants to include in a separate spending package. Conservatives likely will not agree to again grab defeat from the jaws of victory on Obamacare. Barack Obama’s signature achievement – other than doubling the debt, vastly weakening our national security, and growing the economy at the lowest rate of any post-World War II president – likely is on its way out, while Collins will be left with a face-saving deal she can blame the House for not agreeing to. A third Republican this afternoon announced that she opposes the latest effort by Sens. Graham and Cassidy to partially repeal Obamacare, putting an end to the effort as Republicans now lack the 50 votes needed to pass the measure. Republicans were elected to repeal Obamacare and their power stems from people who trusted them when they said they would do this. This is another blow to the Republican Party, which is beginning to many conservatives to seem as irrelevant as the Democrats are virulent. The three Republicans opposing this measure have a right to their opinions, but they don’t have a right to their power, which stems from Republican voters who put the GOP in the majority and therefore in charge of committees. With that in mind, Collins should be forced to give up her chairmanship of the Aging Committee, John McCain should be removed as chair of the Armed Service panel, and Lisa Murkowski of Alaska should get the boot as chairwoman of the Senate Energy Committee. First, both proposals make sweeping changes and cuts in the Medicaid program. Expert projections show that more than $1 trillion would be taken out of the Medicaid program between the years 2020 and 2036. This would have a devastating impact to a program that has been on the books for 50 years and provides health care to our most vulnerable citizens, including disabled children and low-income seniors. Medicaid is going broke. It is not sustainable at current spending levels. And it’s not clear that people have better health outcomes who are on Medicaid. Second, both bills open the door for states to weaken protections for people with pre-existing conditions, such as asthma, cancer, heart disease, arthritis, and diabetes. Some states could allow higher premiums for individuals with pre-existing conditions, potentially making their insurance unaffordable. States could also limit specific categories of benefits for Affordable Care Act policies, such as eliminating coverage for mental health or substance abuse treatment. Forcing people to buy health insurance is unconstitutional – despite the Supreme Court ruling – and making the young purchase it amounts to a massive subsidy paid by them for their elders. They’re already paying for seniors’ Social Security and Medicare. But not everyone with every pre-existing condition can just wait until they get sick to purchase health insurance. There have to be some penalties for not accounting for risks, instead simply making other people pay for it. Third, physicians, patient advocates, insurers, and hospitals agree that both versions of this legislation would lead to higher premiums and reduced coverage for tens of millions of Americans. Who cares what they think? And premiums are already going up under Obamacare. The CBO’s analysis on the earlier version of the bill, incomplete though it is due to time constraints, confirms that this bill will have a substantially negative impact on the number of people covered by insurance. Many of these people will not have health insurance because they choose not to. Others won’t be much worse off, if at all, than they are under Medicaid. AND IN THE LONG RUN WITH UNIVERSAL HEALTH CARE THE QUALITY OF CARE DECLINES AND PEOPLE DIE. Really, nobody in Washington gets it. Senate Republicans served up a lunch of lobster salad and blueberry pie as they gathered on Capitol Hill Thursday to listen to the newly cuddly President Obama. 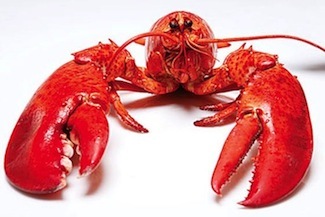 The economy’s in the tank, federal workers and others are losing their jobs because of the sequester, and senators are feasting on lobster. To Obama’s credit, he didn’t eat any, but this is either because he was too busy speaking or possibly because he has to have a food taster – who perhaps was out with food poisoning or something. Otherwise he would have certainly dived in. Lobster is hardly foreign to the Obamas. The lunch was hosted by Sen. Susan Collins, who is from Maine. Okay, fine, they got lobsters there, but every state has fish swimming around somewhere and that doesn’t mean senators should rip the roe out and serve caviar either. This comes on the heels of the lobster thermidor meal Obama dined on with several moderate GOP senators at the Jefferson hotel last week. Filet of prime beef was also served as THE POLITICIANS TRIED TO FIGURE OUT HOW TO CUT THE BUDGET. Sure, Obama picked up the tab, but does the symbolism of such a dinner occur to no one? The prospects for a potential a nomination by President Obama of UN Ambassador Susan Rice to be Secretary of State took a direct hit today when she incurred criticism from a key GOP senator who can’t be accused of sexism, racism, extremism in the defense of liberty, or any of the other attacks being hauled at her opponents by the Democratic mob. Homeland Security Committee ranking member Sen. Susan Colllins, a GOP moderate from Maine, emerged from a meeting today with Rice accusing her of having played an “essentially a political role” during the presidential election by blanketing the Sunday talk shows with the erroneous assertion that the Benghazi attacks stemmed from an anti-Islamic video. Collins said she is also concerned that the Benghazi attacks are an “eerie echo” of the bombings of two U.S. embassies in Africa in 1998. Those bombings in 1998 resulted in the loss of life of 12 Americans as well as many other foreign nationals, and 4,000 people were injured,” Collins told reporters after her hourlong, closed-door meeting with Rice. Obama meanwhile today upped his defense of Rice, saying at the start of a Cabinet meeting that she is “extraordinary” and that he “couldn’t be prouder” of her.